According to a new market research report “U.S. Machine-to-Machine (M2M) Connections Market by Technology (Wired and Wireless), Industry Verticals (Healthcare, Utilities, Retail, Consumer Electronics, Automotive & Transportation, Security & Surveillance, and Others) - Forecast to 2020”, the market size of M2M connections in the U.S. is expected to reach $7,262.76 Million by 2020, at a CAGR of 6.79% between 2015 and 2020. Short-range technologies such as ZigBee, Wi-Fi, and Bluetooth are expected to dominate the M2M Communications market during the forecast period. The market share of wired and cellular technology 2G is projected to decline in the coming years. 3G and 4G/LTE technologies are anticipated to have high growth rates. Rising application of telematics in the automotive industry, demand for smart grids in the utilities sector, coupled with overall standardization of IPv6 are expected to propel the growth of U.S. Machine-to-Machine Communications market. Some of the major industry players in the said market are Gemalto (The Netherlands), Sierra Wireless (Canada), Telit PLC (U.K.), AT&T (U.S.), Vodafone (U.K.), Jasper Wireless Inc. (U.S.), and Intel (U.S.) among others. The U.S. Machine-to-Machine Communications market statistics with detailed classifications and splits based on the respective market size. 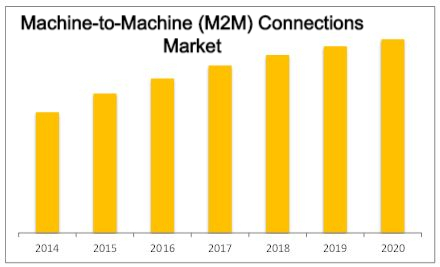 Illustrative segmentation, analysis, and forecast of the major industry verticals to provide an overall view of the M2M connections market in the U.S. Detailed competitive landscape with identification of the key players in each type of product and application and an in-depth market share analysis with the respective revenue and market share rankings. Complete value chain analysis of the M2M Communications market landscape along with the key stakeholders.